Mumbai Metro, Mumbai’s first Mass Rapid Transit System, will cross Andheri’s JOG flyover on Western Express Highway at a height of 22m by a Cable Stayed Bridge for its first line – the VAG corridor. Extended Pier caps have been designed to avoid Piers at the centre of any traffic junction to allow larger spans – a first in the world for Metro Projects. 16 trains will be put in service with a four coach unit carrying 1500 passengers, reducing the travel time from 90 to 21 minutes. 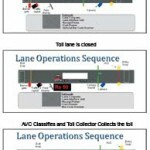 Toll Collection systems should now make pre classification of vehicles mandatory. This means that the present toll systems in the country need upgrading. ETC Systems, a vehicle indentification technology based on EPC, Gen-2 and ISO 18000-6C standards, will entirely transform toll collection in India. As it provides a centralised database and a unique ID to vehicles, it will enable the usage of many other applications too. Janmarg, a project of Ahmedabad Municipal Corporation under JnNURM, is planned as an evolving system. A one of its kind project, it is sensitive to the needs of the people its vehicles carry.